Click here to listen to the story. Transcription below. Nearly 1 million kids who start high school every year don't make it to graduation. At a time when federal and state budgets are tight, dropouts costs taxpayers hundreds of billions of dollars in lost revenue, health care, welfare and incarceration costs. LINDA WERTHEIMER, host: This week NPR will be airing a five-part series on America's dropout crisis. To give you an idea of what that means, just under four million kids begin ninth grade every year, but about a fourth of them don't make it to graduation. That's almost a million dropouts every year. According to one estimate, from the American Council on Education, there are currently 40 million Americans who never graduated from high school. That is an enormous cost for them as individuals, for the rest of society. NPR's education correspondent Claudio Sanchez is here to talk to us about the series. Claudio, the school dropout situation, that's not new. Why focus on it now? CLAUDIO SANCHEZ: The genesis of this series, Linda, began with the reporting that NPR has been doing on the economy. Everybody is hurting, but for people without a high school diploma, the numbers are staggering in terms of unemployment, lost earnings and cost to taxpayers. It wasn't that long ago, remember, that if you dropped out of high school you could still manage to find a good job. But today, the people who seem to be hurting the most in our sputtering economy are dropouts. WERTHEIMER: So it's a cost to individuals of income? SANCHEZ: A high school dropout, according to the latest statistics, will earn $200,000 less than a high school graduate over his or her lifetime, and almost a million dollars less than a college graduate. The unemployment rate for dropouts right now is anywhere from 15 to 18 percent, double what it is for high school graduates. It represents just an enormous loss of human potential. WERTHEIMER: What about the cost to taxpayers? SANCHEZ: Well, that's pretty staggering as well. There are estimates of anywhere from 320 to 350 billion dollars to taxpayers. That's in lost wages, taxable income, health, welfare, incarceration costs. We spend a lot of money on these kids. One other interesting statistic. The vast majority of dropouts today are Latinos and blacks. Now, if high schools were to raise the graduation rate of both these groups to the level of whites - white kids graduate at about 82 percent, so there's an assumption that it is a 10-15 percent dropout rate - personal income for blacks and Latinos would add more than $310 billion to the economy. That is serious money. WERTHEIMER: So, is the dropout problem getting worse because of the economic downturn? SANCHEZ: I think the answer is yes. But it depends on who you talk to, or whose data you rely on. The data can be easily manipulated. In 2007, when the economic downturn began, the U.S. Bureau of Labor statistics reported that nearly 60 percent of high school dropouts were unemployed or not in the labor force. In our reporting we have found that dropouts 25 years and older, for example, often want to come back to get a GED - which is the closest thing to a diploma - but most give up because their reading and math skills are so poor. Many say it's probably not worth coming back and they would rather wait till they're 62 to live on Social Security. Also, one interesting trend is that more and more companies, big and small, won't even consider you if you don't have a high school diploma or a GED. And according to a couple of labor market studies, six out of 10 jobs today require at least two to four years of college. WERTHEIMER: So, did you find anything as you talk to people around the country that suggests that there is some kind of a solution to the dropout crisis? SANCHEZ: I don't know if there's a solution, a big solution out there, but, yes, there are many examples of some communities, some cities and states that have done some good things. Chicago is a good example. It has created a network of 22 charter schools that literally rescue the youngest dropouts, some directly from jail. These kids are getting a second chance to improve their reading, writing and math skills; learn a skill and how to apply for a job. But again, in this economy, there aren't any jobs and the few that are being creating are essentially going to people who are unemployed but with college degrees. The long-term answer, Linda, according to experts, is to intervene early and identify children at the risk of dropping out in the elementary and middle school grades. What we found in Baltimore was that the city has put a lot of time and effort in reducing both the truancy and absenteeism rate. And it claims that it has reduced those rates by half in the last three years. It's a school system that has invested a lot of time and energy in placing psychologists, social workers into some of the poorest schools, especially in East Baltimore. And they're having some degree of success. They're also getting tough on truancy, on absenteeism, where, you know, the city can fine parents $50 or they can essentially put some of these parents in jail, if necessary. So, it's a tough answer but something that absolutely needs to happen to get at this question of a solution to deal with this problem is just to be able to get a handle on the data. The data right now is so unreliable, so useless because states essentially collect their own data and most of those states don't really have a good way to come up with accurate estimates. And so, if states ever get a handle on the data, I think it will go a long ways towards really solving this problem, because people will know what we're up against. WERTHEIMER: NPR's Claudio Sanchez. His series on dropouts begins tomorrow on ALL THINGS CONSIDERED. It will also be on MORNING EDITION. Claudio, thank you. Of all the problems this country faces in education, one of the most complicated, heart-wrenching and urgent is the dropout crisis. Nearly 1 million teenagers stop going to school every year. * The unemployment rate for people without a high school diploma is nearly twice that of the general population. * Over a lifetime, a high school dropout will earn $200,000 less than a high school graduate and almost $1 million less than a college graduate. * Dropouts are more likely to commit crimes, abuse drugs and alcohol, become teenage parents, live in poverty and commit suicide. * Dropouts cost federal and state governments hundreds of billions of dollars in lost earnings, welfare and medical costs, and billions more for dropouts who end up in prison. NPR is looking at the dropout crisis through the stories of five people. Three dropped out of school years ago. They talk about why they left school, the forces in their lives that contributed to that decision and its impact in the years since. There are also profiles of two teenagers who are at risk of dropping out and the adults who are working hard to keep them in school. Patrick Lundvick, 19, quit school in ninth grade. He started running with a gang and selling drugs in his Chicago neighborhood. Within a few years, he was in prison for theft. When he got out, he promised his mother he would change. He's now studying at a special charter school for dropouts and hopes to get his diploma and go to college. But he knows that having a criminal record has damaged his job prospects, and he admits that the lure of the streets is still strong. The single biggest reason why girls drop out of school is pregnancy. And Latinas have the highest teen pregnancy rates of any racial or ethnic group; 41 percent of Latinas leave high school because they get pregnant. These young women often end up with few job skills, more pregnancies and dependency on unreliable and sometimes violent men. Lauren Ortega, 20, is a mother of two who is struggling to finish her high school education. She is torn over whether to stay with the father of her children. A fifth of the schools identified by the U.S. Department of Education as "dropout factories" (where no more than 50 percent of students graduate) are located in rural areas like Oconee County in South Carolina. Nick Dunn, 16, hates school and is teetering on the edge of dropping out — just like his father and his four siblings did. But things have changed a lot since his father was young. Oconee County has watched its economy dry up and even adults are struggling to find work. Studies show that kids who miss a lot of school are at far higher risk of dropping out. By the time he was 12, Danny Lamont Jones had already missed all of sixth grade and much of seventh. Now at 15, Danny is due to enter tenth grade next fall but isn't sure he'll go. Officials in Baltimore are trying to intervene early with kids like Danny to try to keep them engaged with school and prevent them from ending up on an inevitable path toward dropping out. Sixty percent of the nation's high school dropouts are older than 40. Most of them left high school to start working, but few move beyond low paying, dead-end jobs. Only seven percent of dropouts 25 and older have ever made more than $40,000 a year. And in hard economic times, many find that not having a diploma puts them at the end of the employment line. Kenny Buchanan, 44, was 18 when he gave up on high school. He figured he could earn a living without a diploma, and for several years, he did. But then he got married and found it difficult to find work that could support a family. Before long, employers began refusing to even interview him because he didn't have a diploma. This morning features two large and frustrating pieces of economic news. One: Washington’s silly fight over a fake debt crisis (rather than the real debt crisis) isn’t likely to resolve itself in time to avoid a manufactured catastrophe. Two: When measured by wealth, racial inequality in the U.S. is greater than it’s been since 1984. Anybody truly concerned about the country’s future solvency should be most alarmed by the latter news. The racial wealth gap has been enormous ever since the Census Bureau began measuring it 25 years ago. But it has never been larger than today. The median wealth of a white family is now at least 20 times higher than that of a black family and 18 times that of a Latino family, according to an analysis by the Pew Research Center. 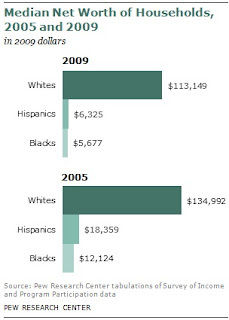 Pew looked at wealth numbers between 2005 and the technical end of the U.S. recession in 2009. It found that the racial wealth gap exploded in that time period, as blacks and Latinos suffered dramatic blows from the collapsed housing market. Median wealth—the net value of your assets versus your debts—fell by 66 percent among Latino households and 53 percent among black households, while it fell just 16 percent among white households. By 2009, median black and Latino families each held less than $7,000 in wealth; the median white family held $113,149. That’s a lot of numbers. But they all add up to something quite simple: When the economy struggles, those who are least secure get crushed. That’s nothing new, and neither is Washington’s refusal to deal with it. With the exception of the aggressive efforts to create a white middle class following World War II, U.S. economic policy has never encouraged economic equality. What’s new today is how much economic policy actually facilitates inequality. Certainly the recent explosion in the wealth gap is owing to the fact that the little wealth black and Latino families hold is disproportionately locked up in homes. White families are far more likely to have jobs with retirement accounts and investments in the stock market. Those black and Latino families that have wealth depend on the housing market for it. But that’s still more symptom than root cause. Black and Latino families are also far more likely to live in places crawling with expensive, deceptive consumer lending of all sorts, from car loans to refinance mortgages. They are more likely to turn to that lending because they make less money and because they already hold less wealth to cushion themselves in tough times. It’s an ugly cycle: inequality across the economy creates demand for predatory credit to bridge the gap, which in turn worsens inequality. So things are right now growing dire in communities of color—with home wealth evaporating, joblessness lingering and wages falling, people have never been more vulnerable to predation. That’s a problem for people of color, yes, but it’s also a problem for the entire economy. After all, we already know what happens when we leave huge segments of our economy open to predatory credit—see under: subprime mortgages and global economic collapse. And with blacks and Latinos already accounting for roughly a third of the people whose labor and spending create the economy—a share that will increase dramatically in the next generation—this sort of deep inequality is simply untenable. Which means today’s Pew study is more of a benchmark than a final tally of the damage done in the past decade. Unless Washington intervenes to get people living-wage jobs and stop banks from preying on their wages with deceptive products, these numbers will grow more dramatic. That’s a problem for everyone. The number of academically unacceptable public schools in Texas increased more than fivefold this year after the state raised standards, leaving parents with a confusing picture of districts' progress. Houston-area schools saw a similar shake-up in their accountability ratings, which the state released Friday. Fewer campuses earned the highest honors, and more landed on the troubled list. The ratings plunge is largely due to the state no longer using a statistical measure that gave credit for failing test scores if the students were on track to pass in coming years. "It's very important for parents to remember that the standards substantially increased this year," said Debbie Ratcliffe, spokeswoman for the Texas Education Agency. In the Houston Independent School District, the "unacceptable" campuses more than tripled to 25 — or 9 percent of its rated schools. Statewide, about 7 percent of schools netted the lowest rating this year. The unacceptable list grew from 104 schools to 569. Four of the nine schools in HISD's Apollo reform program were "unacceptable" despite millions of extra dollars spent on improvement. HISD spokesman Jason Spencer said the turnaround effort is a three-year initiative, and Apollo is entering its second year. Kashmere and Jones high schools and Attucks and Ryan middle schools were the low performers among the Apollo campuses. Kashmere has been rated unacceptable for three straight years. Lee and Sharpstown high schools and Key Middle School came off the state's worst list, moving from unacceptable to acceptable. Schools and districts with the lowest standing face sanctions from the TEA such as appointed monitors and mandatory staff overhauls. The ratings, from best to worst, are exemplary, recognized, acceptable and unacceptable. Cypress-Fairbanks ISD, honored last year as the state's largest "recognized" district, dropped to "acceptable." HISD, the biggest district, also was "acceptable." Among the area's other large districts, Katy, Pasadena, Conroe, Alief, Klein, Clear Creek, Humble, Lamar Consolidated, Galena Park and Pearland earned "recognized" status. "This is a significant accomplishment for our district considering we achieved it under much stricter and higher accountability standards," said Alief Superintendent H.D. Chambers, who took the helm of the district in April. The ratings are based mostly on how well students perform on the Texas Assessment of Knowledge and Skills exams in reading, writing, math, science and social studies. Schools must hit targets for all students and for different racial and socioeconomic groups. Schools' graduation and dropout rates also count. Changes to the accountability system, in addition to the end of the so-called Texas Projection Measure, made it harder for districts to meet the standards. All the test scores of special-education students were counted for the first time. Schools also had to ensure that at least 60 percent of their students with limited English skills passed the state exams to earn the two highest ratings. And the passing standards on the math and science tests — traditionally the hardest for students — increased by five percentage points. This is the last year for the TAKS testing program, which began in 2003. Schools will get a one-year reprieve from ratings as students take the new exams, expected to be more challenging. Test scores traditionally rise over the years as teachers and students get used to the format of an exam. Statewide, at least 90 percent of students passed the TAKS in reading, writing and social studies this year. At least 80 percent passed in math and science. HISD saw its scores remain mostly flat this year. The district's passing rate in math rose two points to 83 percent, while writing dropped two points to 91 percent. "Schools have a pretty good routine based on the TAKS," said state Rep. Rob Eissler, a Republican from The Woodlands who chairs the House Public Education Committee. "It will change when we get to the (new) end-of-course exams and the STAAR tests." The State of Texas Assessments of Academic Readiness will replace the TAKS. Friendswood ISD was the only traditional school district in the greater Houston area to earn the state's highest rating of "exemplary." The charter schools YES Prep, Harmony School of Science, Harmony School of Excellence and Houston Heights Learning Academy also earned the top status. Statewide, 14.5 percent of charter schools were dubbed "unacceptable," compared with 6 percent of traditional campuses. Charter schools are public schools with certain freedoms from state law. KIPP, one of Houston's most popular charter school networks, had its first "unacceptable" campus. Three schools earned the highest rating, and the other 14 were split between "recognized" and "acceptable." Mike Feinberg, KIPP's co-founder, said he was not surprised that KIPP's Sunnyside High School rated low because it opened in 2010 with 120 ninth-graders. He said it takes time to catch up the students. "If this was a full-sized high school, I would be in the hospital right now having a stroke," he said. "But it's the first year out of the gate." Three area districts — Hitchcock, La Marque and North Forest — were rated "unacceptable" overall. The TEA is planning to close North Forest ISD in 2012 after its streak of poor academic and financial marks. Texplainer: Will Budget Cuts Mean Higher Tuition? Bottom line: As schools deal with increasing enrollment and decreasing state funding, it's a safe bet, but not certain, that tuition might rise, even if only modestly. The actual amount is decided on a university-by-university basis by boards of regents. Hey, Texplainer: If budgets are being cut, how much will tuition be going up at Texas universities? In the wake of well-documented budget woes, the state Legislature took a more than 9 percent chunk out of higher education funding for public universities and colleges in the recent session. In June, shortly after the budget decisions were made at the Capitol, the Texas Tech University System Board of Regents called a special meeting in Dallas. It approved a 5.9 percent increase in tuition and fees for Texas Tech University in Lubbock, and a 9.9 percent increase for Angelo State University in San Angelo. “The increase in tuition and fees will enable us to offset a portion of the deficit we’ve incurred due to state budget cuts,” said Texas Tech president Guy Bailey. The increase is expected to generate approximately $8.6 million for his university, which saw a $29.1 million cut over the next biennium. Meanwhile, state Rep. Mike Villarreal, D-San Antonio, placed the blame on legislators. “By slashing state support for higher education, those in control of the legislature pushed these universities to raise tuition and close the door to higher education for many hard-working students,” he said in a statement. Of course, the Texas Tech University System is not the only group to make such a move. Earlier in the month, the University of Houston System approved a 3.95 percent increase for each of its four institutions. The UH System Board of Regents Chairwoman Carroll Ray said it was a last resort. “We understand the financial burden many of our students face, however, the UH System could not absorb the cut in state funding we currently face on our own,” she said. The University of North Texas System regents approved tuition hikes back in March. The 2.8 percent increase at the University of North Texas will mean $101.25 more in tuition and fees for students taking 15 hours this fall and $117.75 in the spring. Unlike some of his peers, UNT President V. Lane Rawlins said the increase was not intended to make up for state budget cuts, but rather to bolster its efforts toward becoming a tier-one research university. Amid the fireworks of its May meeting, which featured the final speech of an outgoing chancellor and a fiery protest from faculty, the Texas A&M University System Board of Regents voted to keep most tuition rates level. However, there were exceptions for specific programs, including three colleges — engineering, veterinary medicine and architecture — at the flagship campus in College Station, as well as some increases at Texas A&M University-Corpus Christi. The University of Texas System addresses tuition for its undergraduate institutions every two years and won’t revisit the issue until the spring 2012, although it did impose an increase on its health institutions earlier this year. House Higher Education Chairman Dan Branch, R-Dallas, has been keeping close watch over the situation. In 2009, he passed a resolution out of the House that encouraged universities to raise tuition no more than 3.95 percent or $280 from year to year until 2013. It didn’t make it through the Senate, but the message was clear. And, Branch said, it appears to have been received. Kenneth Jastrow II 'Overt lack of support' troubling, UT booster says in letter. A leading booster of the University of Texas has written a testy letter to the chairman of its governing board demanding that he stand up for the school's president. The letter to Board of Regents Chairman Gene Powell from Kenneth Jastrow II underscores the continuing divide between Powell and much of the Longhorn nation. The chairman's critics also include major donors, such as Dallas investor Peter O'Donnell Jr., as well as the Ex-Students' Association, also known as the Texas Exes. Jastrow is chairman of the university's $3 billion fundraising campaign and led its blue-ribbon Commission of 125. He wrote to Powell after the regents' chairman issued a statement last month defending Chancellor Francisco Cigarroa, who oversees the UT System's 15 academic and health campuses, against allegations by a dismissed system official, Rick O'Donnell (no relation to Peter O'Donnell Jr.). Although O'Donnell also criticized UT-Austin President William Powers Jr., Powell's statement made no mention of Powers. That didn't sit well with Jastrow. His July 8 letter outlines the Austin president's impressive fundraising record during tough economic times, with more than $1.6 billion raised since the campaign was started in 2008. "Clearly, 191,000 plus donors believe President Powers and others at UT are doing a good job, and they believe in the mission and core values of The University of Texas," wrote Jastrow, former CEO of Temple-Inland Inc. He went on to say, "Your overt lack of support of Bill Powers is troubling, especially given the fact that in a UT System Board of Regents roll call vote, Thursday, May 12, 2011, you voted to support Chancellor Cigarroa and the Presidents of each institution in the UT System which, of course, includes Bill Powers." Jastrow concluded, "You voted to support President Powers, and you should honor your vote." Powell did not respond to a request for comment Monday. Jastrow's voice is a powerful one in the UT community. Chosen by then-President Larry Faulkner to head the Commission of 125, Jastrow led a panel of more than 200 civic and business leaders who spent two years studying the university and preparing recommendations that have prompted a revision of the undergraduate core curriculum and other changes. Powers tapped Jastrow in 2008 to lead the $3 billion fund drive, dubbed the Campaign for Texas, which seeks to underwrite scholarships, faculty endowments, construction projects, research and athletics. O'Donnell, who had been hired March 1 by Powell, was dismissed April 19 after accusing top UT System and UT-Austin officials of suppressing data showing that a growing sum of tuition and taxpayer money is paid to professors and administrators who do little teaching. 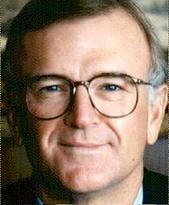 Within hours of the June 27 release of the settlement reached by O'Donnell and the system to avoid litigation, he lashed out during an interview with the Statesman at Cigarroa, Powers and state Sen. Judith Zaffirini, a Democrat from Laredo who leads the Senate Higher Education Committee. O'Donnell charged that the trio had mounted "a brutal campaign" to demonize regents who have been active in pursuing data on faculty members' research and teaching output, including Powell, Alex Cranberg, Wallace Hall and Brenda Pejovich. O'Donnell said Cigarroa and Powers had ginned up opposition among donors, alumni and faculty members to the collection of such data. And he said Powers begged him and Powell not to collect the data. In his response on June 28, Powell said: "At no time did Chancellor Cigarroa encourage donors and alumni to actively oppose efforts by the Board of Regents and Mr. O'Donnell to obtain various data. Furthermore, Chancellor Cigarroa did not encourage 'a brutal campaign' against specific members of the Board of Regents. The Board of Regents has an excellent relationship with Chancellor Cigarroa and fully supports his vision and commitment to advance excellence in education, research, patient care and service across the great University of Texas System." Jonathan Kozol has been a tireless advocate for civil rights in education for the past five decades. His book, Savage Inequalities, was a call to conscience for the nation. He will be among the speakers at the Save Our Schools March and Rally in Washington, DC, on Saturday, July 30th. I asked him to explain his reasons for marching this summer. Texas has two middling public universities. It's time they reward professors who can actually teach. The chancellor at Texas A&M is forced to retire. 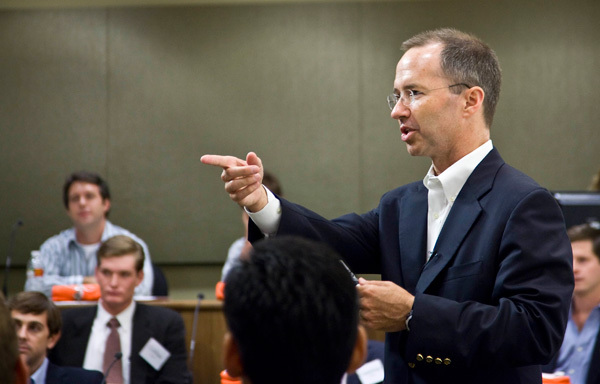 A special adviser hired by the UT Board of Regents lasts 49 days before he is fired. In Texas, we have one great research university, Rice, which consistently ranks among the top 20 universities in the United States. We also have two middling ones, UT Austin and Texas A&M, which usually rank somewhere in the top 70. Research universities are economic engines, there’s no doubt about it. But it took an Austin entrepreneur and teacher named Jeff Sandefer to ask a question that is starting to reverberate in Texas and throughout the nation. Sandefer’s question is: what is it about a research university that makes it an economic engine? Is it the actual research itself? Or is it the professors who are attracted to a university because of its research? Is it quantitative research, the lab work of biologists and engineers and computer scientists? Is it the ability to attract grants from the federal government and foundations? Is it the ability to turn laboratory ideas into commercial applications? What is the contribution of qualitative research, the ongoing scholarship of English and history and philosophy professors? Might it be, Sandefer asked, that teaching is the greatest economic contribution a research university can make? Could it be that accomplished students are worth more to Texas than research grants? In 2001, when Larry Summers took over as president of Harvard University, he found a situation not unlike what exists today at UT and A&M. Tenured professors had delegated teaching to graduate assistants while they pursued their specialized subjects. Undergraduates were considered a nuisance. Research and publishing were the keys to academic recognition. Summers challenged professors to get back into the classroom. His position was unpopular. But it probably saved Harvard’s reputation as the best undergraduate college in America. Today at Harvard, as at Rice, tenured professors teach freshmen, sometimes in seminars as small as eight to 15 students. The days are gone when a great research university could attract faculty and allow them only to pursue ever more specialized study, which, when they had to teach, they then inflicted on undergraduates. Sandefer has proposed a series of reforms for Texas that would reset faculty standards. He suggests splitting research and teaching budgets to encourage excellence in both. More important—and this is where a culture change really takes effect—he thinks evidence of teaching skill should be required for tenure. And he thinks our universities should publicly recognize and reward professors who demonstrate extraordinary teaching ability. The reaction has been heated. University administrators have circled the wagons. They’ve pulled in the Association of American Universities (a consortium of university presidents and chancellors), contacted major donors, and gone to the Legislature. A widely publicized study by the Center for College Affordability and Productivity in support of the reforms turned out to have conflated data on part-time and full-time professors, making it seem as if 20 percent of the faculty did 57 percent of the teaching (which is not true). The mistake gave the administration the ammunition it needed just at the moment it needed it most. I sympathize with the administrators and the faculty. It is tough to work one’s entire professional career under one set of standards and expectations, only to be told that they no longer apply. (I know. I’m in the media business.) But the fact is, the system of measurements and rewards will change. It has to. The present incentives lead in the wrong direction. The costs of faculty-run universities are too high. Neither our state government nor the middle class these universities were built to serve can afford them. Jeff Sandefer has been ahead of the curve. It is urgent that our two major public universities get ahead of the curve themselves. A renewed push for a failed immigration bill has drawn local support, though advocates admit it has little chance to pass congressional hurdles before 2012. Late last month, a Senate subcommittee held Congress’ first-ever hearing on the Development, Relief and Education for Alien Minors, or DREAM, Act, which would grant a pathway to citizenship for undocumented immigrants brought to the U.S. as children. The DREAM Act passed the House of Representatives but failed to get enough votes in the Senate to overcome a Republican filibuster in December, dying in the upper chamber as the University of Texas-Pan American held its fall commencement ceremony. Opponents often criticized the legislation because it had not received a full hearing before any committee. And though Hinojosa did not expect the act to pass before the presidential election next year, he did hope the hearing last month helped garner more support. “I don’t care if you had 50 hearings. It wouldn’t change (Republicans) minds,” he admitted. If passed, the DREAM Act would allow immigrants brought to the U.S. before their 16th birthday to finish either two years of higher education or military service before granting them six years to earn lawful, permanent residency. The DREAM Act won backing from the Rio Grande Valley’s newly created Hispanic Tea Party, deviating from the more established Tea Party group’s stalwart opposition to the bill. “The Anglo (Tea Party) doesn’t see the same perspective as Hispanics,” said founder Armando Vera, a McAllen pastor. 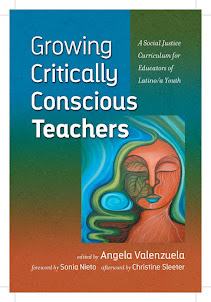 “It was necessary to develop the Hispanic Tea Party to raise these voices (of) other Hispanics. Like Hinojosa, Vera speculated the DREAM Act will see little success before 2012. But in the meantime he committed his organization to helping immigrant youth who want to stay and study in the U.S.
“They’re brilliant,” Vera said. “We have seen some cases and offer them a lot of services, but they need more help, more support. The immigrant problem will continue. Multiracial students are being tallied for the first time in Texas history, but their standardized test scores won't appear as a separate group when accountability ratings are released Friday. As it grapples with increasing diversity, Texas has opted not to measure the scores of the state's 78,419 multiracial, non-Hispanic students as an ethnic subgroup whose performance matters in determining whether a school made "adequate yearly progress." Instead, they'll join the ranks of the 180,000 Asian students lumped in with their schools' entire student body for accountability purposes. Texas continues to only hold three racial subgroups accountable: whites, blacks and Hispanics. Other states have expanded their systems to measure as many as eight ethnic and racial groups. "I don't know why Texas would go back, while the rest of the country is going forward," said Susan Graham, a founder of Project RACE, a California-based group that advocates for multiracial students. Racial and ethnic categories are important not only to students' sense of identity, but also to the researchers and educators who depend on accurate data on high-stakes tests to determine campus rankings and bonus pay, among other decisions. Schools can face sanctions as serious as being closed based on the performance of students in one ethnic subgroup. A 2007 federal mandate now requires all states to ask student whether they are Hispanic or not Hispanic, and then whether they are white, black, Asian, American Indian or one of two new categories — Native Hawaiian or two or more races. While Hispanic students may identify themselves as multiracial, the federal government has ruled that they won't be included in that tally. They want accurate results, but they don't want to gather cumbersome amounts of data. "Through this system, there will be no double reporting of persons identifying with multiple races," according to a U.S. Department of Education document on the decision. It's up to each state, however, to decide which racial groups to measure separately in its ratings. The Texas Education Agency has said a racial group should make up at least 10 percent of the state's student population to trigger inclusion. African Americans, the smallest group in Texas, slipped to 13 percent in 2010, down 1 percentage point with the introduction of the multiracial category. While Texas is sticking to its three racial categories, California - where 1.8 percent of student are multiracial - is among those expanding to include the group. Any California school with more than 100 multiracial students will be measured on those students' performance. State officials weren't sure how many campuses, if any, had a high enough concentration to be included in the ratings, which will be released there in August. As Texas transitions to the new categories this year, state officials have opted to return some multiracial students' scores to their previous category, if records indicate that the student was originally listed as white or African American. Their scores will only count in that previous category if they improve the school's rating. State officials said they're aware of the concerns that could be created this year by allowing students to be moved between categories. The TEA will analyze data from districts and campuses with significant discrepancies in the percentages of multiracial students between fall 2010 and spring 2011, spokeswoman DeEtta Culbertson said. Houston-area officials said they aren't sure what the new categories will mean to their ratings. Many districts have small numbers of multiracial students - Galena Park reported 110 - so chances are they would be inconsequential this year. But the category is expected to grow quickly. Texas had 679,001 people self-identify as "two or more races" in the 2010 Census, up 32 percent from 2000. Advocates worry that the new guidelines don't allow students to accurately and specifically report their race and ethnicity. Many Hispanics, for instance, feel discounted because they cannot be considered multiracial, Graham said. West Orange-Cove ISD parent Evelyn Smith is glad she no longer has to decide whether she should mark her mixed-race children as white or African-American. While they may look more like their father, Smith said she didn't like being cut out of the genetic equation. "They're part of both of us," she said. But the additional category is a hurdle for researchers attempting to track trends over time, said Bob Sanborn, CEO of Children at Risk, a Houston-based advocacy group. "If you're trying to understand school performance under a microscope, mixed race is not really helpful," he said. "Multiracial doesn't act in a particular way." Educators could, however, use the category to hide children whose performance could hurt another subgroup, he said. "I like the idea of a mixed race category. I think it's a reflection of reality," Sanborn said. "It's a good thing for society. Researchers are going to have to adjust." The latest standardized tests in Texas add two subgroups. As promised, this is my follow-up post based on our trip to the Save Texas Schools conference in Austin this past weekend. It was a sobering experience. The long and the short of it is this: Texas has abandoned its children. The Governor and the Legislators in Austin have set the stage for a protracted crisis not only in education but in the State economy. With respect to the former, we can look forward to larger class sizes, the elimination of many important programs, and the placing of even more responsibility of the backs of overworked (and fewer) teachers. Texas already ranked an embarrassing 44th in education and these developments do not bode well for future of the Lone Star State. As far as the economy is concerned, every public education layoff means less income not only for those individuals, but for local businesses where they would have shopped. Indeed, the Legislative Budget Board forecast that almost 45% of job losses would actually be in the private sector (Center for Public Policy Priorities: CPPP Urges Rejection of HB1). Furthermore, the lack of a decent education will greatly reduce the future earning power of Texans. The only firms willing to relocate here will be those hoping to find a source of cheap, low-skilled laborers. Texas will become the alternative to outsourcing to an impoverished, third-world country. The stars at night no longer look so big and bright. A general diffusion of knowledge being essential to the preservation of the liberties and rights of the people, it shall be the duty of the Legislature of the State to establish and make suitable provision for the support and maintenance of an efficient system of public free schools (Article VII). It must be recognized that the Constitution requires an ‘efficient,’ not an ‘economical,’ ‘inexpensive,’ or ‘cheap’ system (Texas Supreme Court, Edgewood ISD vs. Kirby, 1989). This is obviously still open to interpretation, but it seems reasonable to imagine that it would at least represent the same level of service as last year. Surely the State whose economy would make it the 15th-largest country in the world could accomplish such a goal? And, indeed, it has done so every year–until this one. Today, however, it seems that Texas can no longer afford to offer the 44th-best education in the nation (soon to be 50th, incidentally). We are faced with an $18 billion revenue shortfall, of which roughly $5 billion would have gone to education (Center for Public Policy Priorities: Statement on the State Budget for 2012-13). But, to reiterate, this was not an accident. Conscious choices were made and clear warnings were ignored. It started in 2006, when new tax laws were enacted that supporters (including Republican Governor Rick Perry) claimed would generate sufficient revenue to continue to fund education and other programs at required levels. Almost immediately, however, State Comptroller Carole Keeton Strayhorn (also a Republican) wrote to Governor Perry to explain that this was simply not true (Strayhorn Letter). Projections by her office showed that the State would find itself roughly $23 billion short within five years. She was remarkably accurate (in fact, she underestimated). There was, indeed, no way the planned tax reductions could possibly be offset by the legislated increases. But her warnings were completely ignored. And so, when Legislators convened for the most recent session, it came as absolutely no surprise to anyone that revenues were well short of what was needed. In fact, they had been short in previous years, too, but earlier surpluses and federal stimulus funds had provided temporary relief. No more. This time, it would hurt. Or would it? There was actually another option. The State had the foresight in 1988 to create a pool of money for such emergencies: the Economic Stabilization Fund (aka, the Rainy Day Fund). Following on the heels of the 1980s oil-price collapse that devastated the Texas economy, the goal was to systematically accumulate savings during good times which could then be spent in bad. This had, indeed, provided relief in the past, with the Legislature sometimes willing to spend the entire balance (Center for Public Policy Priorities: Using the Rainy Day Fund). And the best news in terms of addressing our current crisis is that the fund has never been larger than it is right now. It is difficult to imagine a more appropriate time to tap into it. Yet, despite vigorous debate (largely along party lines) and a march on the Capitol by those hoping to save Texas schools, the State refused to use more than an insignificant fraction. Apparently, it is not raining–but, boy, it soon will be. In fact, if we make no attempt to address the structural deficit, the revenue shortfall “will more than double again in two years regardless of how the economy performs” (Take Back Texas Alliance: Texas Budget Crisis). Our problem isn’t going to go away on its own. And so, here we stand today. The government of the Great State of Texas has willfully elected to disregard its constitutional duty to fund education at even the modest levels represented by previous years. They ignored clear and prescient warnings regarding future revenue streams and chose not to tap into monies set aside for precisely such purposes. It will almost certainly get worse, and they know it. They are failing our schools, our children, and our State. 1) If that is your goal, then have the integrity to say it out loud. Don’t hide behind claims of fiscal crises and incompetent educators. The former is a smoke screen, one that may have been purposely manufactured for just this purpose. The revenue issues could most certainly be addressed if Legislators were willing to discuss tax reform (Take Back Texas Alliance: Texas Budget Crisis; Center for Public Policy Priorities: List of $30 Billion in Revenue Options). The latter, meanwhile, simply isn’t true. The scholarly research on the American public education system argues that it measures up very well against those of other countries. Those saying otherwise are either cherry picking statistics or simply do not understand how to interpret them (for more on this, see my previous post: Why US Education Deserves Our Praise). 2) Let’s not kid ourselves about what privatization of education would really represent. It would mean abandoning the poor, disenfranchised, and otherwise challenged children of our State. That’s not just mean-spirited, it is un-American and undemocratic. Our system of government requires an educated citizen more than any other. I’m sure I don’t need to argue this, so I’ll simply close with some relevant quotes. Hopefully, Governor (and Presidential Candidate?) Perry and certain Texas Legislators will give these a read. I hope so, as it seems they are the ones most in need of an education. In a global economy where the most valuable skill you can sell is your knowledge, a good education is no longer just a pathway to opportunity–it is a pre-requisite. Many thanks to Scott McCown of the Center for Public Policy Priorities for reviewing an earlier version of this post. Thanks, too, to my wife, Melanie, for her insights and editorial advice. All remaining errors are, of course, my own. For the third consecutive year, the Austin school district as a whole will miss federal academic targets established by the federal No Child Left Behind Act, district officials told the American-Statesman. The prediction is based on preliminary data from the Texas Assessment of Knowledge and Skills that show unsatisfactory improvement by special education students on math and reading exams. The official federal school accountability ratings will be announced in August. District officials said they couldn't say with certainty how many of the 118 schools to be rated this year also failed to make "Adequate Yearly Progress" because the state has not yet released that data. Of 115 Austin schools evaluated last year, six failed to meet the federal standards. The federal requirements are different from those under the state's accountability system and are based on TAKS participation and passing rates, as well as graduation and attendance rates. Austin missed targets because the district allowed too many special education students to take a modified or alternative version of the reading and math tests, based on federal standards. Of the district's 85,697 students, 9.7 percent, were served by special education in 2010-11, including those with physical and learning disabilities, as well as emotional and behavioral disorders. Officials said of the 4,327 special education students who took the TAKS — 11.8 percent of test takers — 3,948 took a modified or alternative version of the reading and math tests. The other 379 special education students took the standard TAKS. Though 83 percent of special education students passed the reading exams and 81 percent passed the math exams, which meets passing standards , the federal system counted about 1,000 of those students as failed. The federal system has a 3 percent cap on how many students can take a modified or alternative exam even if students qualify to take it. Modified tests include those in larger fonts or that offer fewer multiple choice options. District officials said despite being over the limit, they are giving special education students tests consistent with their individual education plans and their disabilities. "The bottom line is: You have to do what's right for the kids," said Bill Caritj , the district's chief performance officer. "You can't just give kids the regular TAKS test because it's convenient for you when it's not what's best for them. "We're doing what's appropriate. We're giving them the correct instruction. We are giving them the correct tests, but we can't count them (as) successful because of the federal rule." Despite missing the targets, district officials said they are pleased with the progress that special education students have made. Those students made gains in all areas that exceeded gains of students overall. Graduation rates for special education students have increased for the second consecutive year, from 56.5 percent for the class of 2008 to 61.3 percent for the class of 2010. By comparison, overall graduation rates were 74.3 percent in 2008 and 78.6 percent for 2010. Austin isn't alone in exceeding the federal special education cap. Houston data show that of 118,478 students tested this year in reading, 6 percent took a modified or alternative version of the test; of 118,610 students tested in math, 5.7 percent took a modified or alternative version . Federal officials recognize problems with the system. U.S. Education Secretary Arne Duncan said in June that if there are not changes to standards created by the 2002 No Child Left Behind Act, 83 percent of all schools could be classified as failing next year because of tougher passing standards or other reasons. Still, it's unclear whether Congress will make any changes to the law. Each time the Austin district missed the mark, students made the required progress, but the district exceeded the special education cap. "We want to meet the needs of all kids, and a message of missing AYP gives the perception that we're not," school board President Mark Williams said. "We can't change the accountability rating for (2011), but we can say how we are going to change it to make it better going forward." Austin serves a large number of special education students in part because the district has a reputation for having strong programs for those students, officials said. "Our team does a really nice job. And in some ways, it attracts some people to the district to get those services," Williams said. "When that happens, you get a number higher than what the feds allow us to consider." those students to take the standard achievement exams. The stakes are high. Districts that receive federal Title I funds and continually fail to miss the federal targets stand to come under stringent sanctions at failing schools , including firing teachers or having the Texas Education Agency or a charter operator take over the school. Note:Students may have more than one diagnosis. With the nation's economic concerns mounting, President Obama is again turning to its research universities for help. In a speech Friday morning at Carnegie Mellon University, in Pittsburgh, the president announced a $500-million endeavor through which universities and companies will be asked to develop innovations in manufacturing with the goal of expanding domestic employment. "American innovation has always been sparked by individual scientists and entrepreneurs, often at universities like Carnegie Mellon or Georgia Tech or Berkeley or Stanford," Mr. Obama said. "But a lot of companies don't invest in early ideas because it won't pay off right away. And that's where government can step in." The idea is based on recommendations from the President's Council of Advisors on Science and Technology, an advisory group of scientists and engineers. "Investing in manufacturing based on new technologies can provide high-quality, good-paying jobs for American workers," Eric S. Lander, a co-chairman of the advisory panel, said on Thursday in a briefing with reporters. Mr. Lander is director of the Broad Institute of Harvard and MIT, a biomedical research center in Cambridge, Mass., that is jointly run by Harvard University, the Massachusetts Institute of Technology, and the Whitehead Institute for Biomedical Research. The White House hasn't worked out all details of the effort, including the degree to which it will involve actual research versus commercialization of discoveries. Organizers have, however, identified some initial projects, including allocations of $100-million to develop new materials used in manufacturing and $70-million for robotics development. Such work is similar to federally financed research already taking place on university campuses that is coordinated by the National Science Foundation, said Ron A. Bloom, assistant to the president for manufacturing policy. The new effort, however, is expected "to provide more focus and direction to this spending." The total amount of money isn't guaranteed, with the $500-million coming both from money already included in the NSF budget and from future increases requested by the president, Mr. Bloom said. The administration has invited six universities to join the effort, with more expected to participate later, he said. The initial six are Carnegie Mellon, the Georgia Institute of Technology, MIT, Stanford University, the University of California at Berkeley, and the University of Michigan at Ann Arbor. The University of Michigan's president, Mary Sue Coleman, said that while those six were probably chosen because of their expertise in manufacturing engineering, the project is especially important to her state, given the decline of its signature automotive industry. Ms. Coleman, who joined President Obama for the announcement at Carnegie Mellon's National Robotics Engineering Center, said she hoped to emphasize to the president the importance of filling the financial gap between discovery and commercialization. Ms. Coleman said that she planned to join President Obama for the announcement at Carnegie Mellon's National Robotics Engineering Center, and that she hoped to emphasize to the president the importance of filling the financial gap between discovery and commercialization. In Michigan, she said, university researchers and companies already can get federal money to invent better ways of making products. The problem, she said, is in the development phase. For example, many small automotive-parts manufacturers don't have the $500,000 to $700,000 they typically need to apply an innovation on a commercial scale. "I have talked to a number of our scientists, and they say this is a real hang-up," Ms. Coleman said. And some economists point out the general difficulty of ensuring that greater spending on improving industrial technology will really create more jobs. Labor history in many fields, especially agriculture, has shown that innovation can often lead to machinery's replacing human workers, rather than creating new jobs, said James L. Butkiewicz, a professor of economics at the University of Delaware. In that regard, universities could be especially important, Mr. Butkiewicz said. That's because manufacturing innovations discovered at universities often center on improving products, which can increase sales and thereby boost employment, he said. Companies, by contrast, might be more focused on improving the efficiency of their manufacturing methods. It will be difficult to judge how well President Obama's new effort will succeed in that regard until more specifics are known, he said. Mr. Obama has repeatedly emphasized the importance he places on universities in preparing American workers for a more-competitive future, in which job success is increasingly tied to educational achievement. At separate events earlier this month, he touted business partnerships with community colleges as a means of helping American workers find new manufacturing jobs, and outlined plans to help train 10,000 new engineers a year. The president planned the trip to Pittsburgh among growing signs—including stagnant hiring rates, high gas prices, and financial troubles in Europe—that the economic worries of the past five years will continue. University and company officials leading the president's advisory committee said they were confident the $500-million effort would lead to substantial domestic job production, though they said they could not offer any estimates of how much. One member of the presidential advisory panel, Eric E. Schmidt, executive chairman of the technology company Google, said some technological improvements could cost American jobs. But over all, Mr. Schmidt said, university-driven improvements in manufacturing technology would undoubtedly help employment. "Given that the world is moving to more sophisticated and more complex products, wages and growth go to the people who master that," Mr. Schmidt said after the president's announcement. "And ultimately you have two choices: You can basically decide that you're going to invest in the way that we're describing, and build these industries in America, or you can permanently give them up to somebody else. And it's pretty obvious I think to all of us that strategically these are the jobs that America wants and here is a mechanism to get them." The White House, as part of its announcement, said Mr. Obama would be asking his National Economic Council and his Office of Science and Technology Policy to help develop specific strategies for the endeavor. The recommendations from the advisory panel led by Mr. Lander included an expansion of federal investment in shared facilities, such as federal and university laboratories, that small and medium-size companies could use to develop new products. The panel's recommendations also included encouraging a new level of partnerships between industry and academe to identify emerging technologies—such as small-scale flexible electronics and advanced materials—that could be especially valuable in helping the American manufacturing sector to grow. State spending on financial assistance to students increased by 3.8 percent in 2009-10, even as many governments struggled with recession-driven cuts in many programs. But nearly half of all states cut back on their all-important spending on need-based financial aid, even as enrollments boomed and as many students and families struggled to keep pace with tuitions that public colleges (or their legislatures) raised sharply. Those are among the key findings of the annual report on state financial aid spending by the National Association of State Student Grant and Aid Programs, released today. In all, states raised their spending on student financial assistance of various types -- need-based and non-need-based grants, and nongrant aid -- to $10.8 billion in 2009-10, up about 3.8 percent from $10.4 billion in 2008-9. But the 2009-10 growth in need-based aid was uneven, revealing significant differences in how states weathered the first full year of the downturn and how much they prioritized student financial aid as they allocated their constrained funds. Slightly more than half the states bolstered their need-based-grant spending -- with states such as California, New York and Pennsylvania among the 10 that did so in double digit percentages. In some of those states, though, tuition rose much more sharply; California's two public college systems raised their tuitions by more than 30 percent in 2009. Others, however, responded to the rush of students returning to college in the downturn by curtailing their financial aid awards. Ohio slashed its spending on need-based aid by two-thirds (from $225 million in 2008-9 to $76.3 million in 2009-10), and Michigan cut its in half (as did Alaska, but from very little -- $1.97 million -- to virtually nothing). LONDON -- The British government released its long-awaited "white paper" on the future of higher education, offering a sweeping set of proposals that would produce dramatic changes in how the country would educate students and fund institutions. Under the plan, for example, a quarter of all student places are to be open to full competition in 2012-13, in a government bid to force higher education institutions to vie for the brightest and best applicants at one end of the sector, and to compete on price at the other. And for-profit providers of higher education would be given full access to the student loan system on condition that they agree to follow the same rules on standards, quality and fair access as publicly funded institutions. The reform plan released by British government's Department for Business Innovation and Skills says that in the first year of the new funding regime, around 65,000 high-achieving students will be able to go to whichever university will have them. This represents a change from the present strict controls on the number of students each university can accept. It raises the prospect of some elite institutions expanding their intake to vacuum up more top students. The government’s aim is to ensure that students with very high grades -- AAB or above -- on the country's college entrance exams will have a better chance of reaching their first choice of university. These institutions could include not only further education colleges (roughly equivalent to American community and technical colleges), but also private providers, with the government taking steps to ensure that such institutions are operating on a more “level playing field” (see below). Taken together, the government expects the changes to make a total of 85,000 student places open to competition between institutions -- around one in four of the total number. It has indicated that this proportion may increase over time. However, this new contestability will sit within an overall cap on the total number of student places in the sector. Consequently if some elite institutions expand their intake, it will be at the expense of others, which will necessarily have to shrink. It also means that highly selective institutions, such as those in the 1994 and Russell Groups (consortiums of elite universities), will have to compete for a large proportion of their students, many of whom already achieve AAB or above on the "A level" exams. Speaking to Times Higher Education, David Willetts, the government's universities and science minister, said the aim was to "dynamize the [British higher education] system." “It’s a very fine judgment we’ve had to reach," he said. "On the one hand I was very keen … not to break down the old quota system, [but] we wanted something that was more open and liberal. On the other hand, there’s quite a lot of change happening in 2012, and the last thing I want is a kind of change so disruptive that our universities can’t handle it. Willetts denied that the government’s aim was to create an elite set of institutions in which all the top-achieving students were concentrated. He argued that with funding following the student, and universities and colleges forced to compete for those students, the quality of teaching and learning, and the student experience, would rise. “We’ve got very strong incentives to reward research, and the intense competition through the [research excellence framework] and research councils has yielded an incredibly strong research [base]. We haven’t had comparable incentives on teaching,” he said. In addition to changing how students compete for spaces in British universities, the White Paper would shake up the regulatory regime governing higher education in the country. All providers, including those with for-profit status, would be subject to the same oversight if they have loan-funded students. The new regime is likely to include a transformed, but not renamed, Higher Education Funding Council for England, which would become a “consumer champion” with beefed-up powers to act on concerns raised by other bodies such as the Quality Assurance Agency for Higher Education, which is designed to regulate institutional quality and student qualifications. Meanwhile, the QAA would move toward a more “risk-based” approach to inspection that makes it easier for student complaints to trigger an audit, as well as reducing the burden for universities with a good track record. There are no plans to create a single “super quango” to regulate the sector -- as proposed in another government review released last fall -- but Willetts envisaged that the government funding agency could ultimately have the power to stop institutions accessing the student loan system if they run foul of the rules. “I would say that [HEFCE’s] powers will be linked ultimately to whether it will [allow money to be loaned] to students to pay the fees to go to institutions. “Some of the conditions that are currently attached to [teaching] grants -- in a modernized, light-touch way -- will be attached to eligibility to student support,” he said. There are also proposals to allow the Office for Fair Access to impose new fines if a university or other provider fails to keep to agreements on helping poorer students. Meanwhile, the white paper says the government will look at the rules governing degree-awarding powers and university title, which could make it easier for companies, further education colleges and providers from overseas to enter the market. On university title, the government aims to look at the rules specifying how many students an institution must have before applying for use of the term. With degree-awarding powers, there are proposals to remove the barriers that can prevent non-teaching institutions such as examining boards from offering degrees that can then be taught by institutions such as further education colleges. Anthony P. Carnevale and his Georgetown University Center on Education and the Workforce have released another report aimed at making the case that the United States needs 20 million more college-educated workers by 2025. The work of Carnevale and other economists reinforces -- and in many ways has influenced -- the Obama administration's push to have the United States return to the top of international rankings of countries with the largest proportions of citizens with college credentials. That campaign has been threatened by the country's economic woes, which have forced the federal and state governments to impose or consider cuts in spending on higher education and student aid, and by ever-rising tuitions that have pushed college out of reach for more students and families. The administration's policy approach has also been challenged increasingly by skeptical commentators and policy analysts (many on the right, but some on the left), who cite the large numbers of unemployed bachelor's degree recipients now to question the historical assertion that education is the key to economic success, for individuals and nations. In their new report, "The Undereducated American," Carnevale and his co-author, Stephen J. Rose, acknowledge that "with many college graduates unsuccessful in finding work in the current economic climate, the temptation to reject postsecondary education as a viable economic option grows stronger, especially among working families for whom college costs are always a stretch." But they aim to use historical data to show that the analysts (and parents of recent graduates who may feel that way) are engaged in short-term thinking. At its simplest, their argument goes like this: Up until about 1980, the United States produced college graduates (at the bachelor's degree level, with some associate degrees mixed in) roughly in proportion to the demands of employers. But beginning around then, and accelerating around 1990 (as the number of retiring workers grew and the academic credentials of those replacing them began to ebb), the report shows, the rate of increase in the number of college-educated workers slowed, to 2.0 percent from 1990 to 2000 and 1.0 percent from 2000 to 2010. As it did so, it failed to keep pace with employers' demand for skilled workers, which grew at a 3.6 percent clip through 2005. The gap between supply and demand drove up what employers were willing to pay for college-educated workers, Carnevale and Rose assert, creating an ever-rising "wage premium" -- the gap between what college graduates and high school graduates earn. College graduates earn 74 percent more than do high school graduates today -- a gap that is up from 40 percent in 1980. That wage premium is one of several factors driving income inequality in the United States. If trends stay on their current course, Carnevale and Rose argue, with the number of college-educated Americans growing by 1 percent a year, the country will produce eight million more postsecondary-educated Americans by 2025, pushing the wage premium up to 96 percent. Instead, the scholars assert, the country needs to propel the college-going rates so that the rate of educated workers grows by 2.6 percent a year instead, which would mean adding a total of 20 million (instead of 8 million) -- 15 million with a bachelor's degree, and 5.3 million with associate degrees or certificates of various sorts. That would not only allow the wage premium to shrink to 46 percent, much closer to what it was in 1980, but increase the gross domestic product by about $500 billion over what it would be without those better-educated, higher-earning workers. Achieving such a goal is "not beyond our capacity" -- but it will be difficult, Carnevale said in an interview about the report Sunday. There are two main ways to increase college going rates, he said -- with additional money for students and/or institutions, or increased efficiency in the higher education system. With states cutting back on their fiscal support for institutions, and the push for deficit reduction likely to compel limitations, if not cutbacks, in spending on Pell Grants and other student aid, significant new investment in higher education is unlikely unless or until politicians agree on some combination of increased taxes and spending reductions to reduce the deficit. Both are probably necessary over the next several years, Carnevale said, with changes to Medicare at the core. "There is no little green pill for our budget problems." Higher education has not historically been inclined to look for efficiency, but it is likely that "as money slims down, there will be kicking and screaming, and higher ed will move toward efficiencies," he said. If not, he said, "individuals are going to lose massive amounts of opportunity, and the economy will lose" much-needed revenue. "There is a problem here." Andrew Gillen of the Center for College Affordability and Productivity, which has produced several critiques of Carnevale's analysis in the past, questioned the report's assertion that college attainment itself drives economic growth. "Eric Hanushek and Ludger Woessmann have numerous studies showing that it is not attainment that boosts growth, but [instead] increases in cognitive skills," he said via e-mail. "In other words, increasing college attainment will only boost growth if it increases cognitive skills, and recent research (such as Academically Adrift) calls into question how much college boosts cognitive skills. The main takeaway is that if you are worried about growth, the focus should be on quality rather than quantity." Some Southern California teachers are finding ways to keep creativity in the lesson plan even as they prepare their students for standardized tests. Even as the annual state testing season bore down on her this spring, fourth-grade teacher Jin Yi barely bothered with test prep materials. The Hobart Boulevard Elementary School teacher used to spend weeks with practice tests but found they bored her students. Instead, she engages them with hands-on lessons, such as measuring their arms and comparing that data to solve above-grade-level subtraction problems. "I used to spend time on test prep because I felt pressured to do it," said Yi, who attended Hobart in Koreatown herself and returned a decade ago to teach. "But I think it's kind of a waste of time. The students get bored and don't take it seriously and it defeats the purpose." Yi's approach seems to work: She is rated "highly effective" in a value-added analysis by The Times based on her students' standardized test scores in English and math. She also ranks among the Los Angeles Unified School District's top 100 third-, fourth- and fifth-grade teachers in English in that analysis. Who says students need "drill and kill" exercises to raise their test scores? The pressure to improve student test performance in California and across the country often meets with disdain from teachers who say they are compelled to throw out creativity and "teach to the test." The phrase is usually code for teachers who are forced to abandon creativity and focus exclusively on areas tested — reading, writing and math. That, critics say, shortchanges students of such other important subjects as art, history and even science in some grades. A.J. Duffy, former president of United Teachers Los Angeles, for instance, dismisses the weeks before spring testing as "Bubbling-In 101," a reference to class time spent teaching students how to select correct answers. Visits with Yi and other successful teachers around Los Angeles County, however, suggest that innovative teaching and rich classroom experiences need not be sacrificed in the quest for better test scores. But it's not easy to have it all. Several teachers interviewed said they spend hours of extra planning time and hundreds of dollars to create more interesting lessons. They say they must be supremely organized and strict enforcers of classroom rules. And some quietly skirt official district schedules to run with their own approaches. Next door to Yi, Hobart fifth-grade teacher Rafe Esquith has cut down L.A. Unified's prescribed reading program from three hours a day to 75 minutes, saying his students can work on reading comprehension, vocabulary and other skills through other subjects. That opens up time to learn physics by building model roller coasters and rockets and to grasp history with Ken Burns documentaries. His students work on long-term art projects, perform Shakespeare and learn musical instruments. "To teach all of the lessons they want us to teach using the official district schedule is impossible — it can't be done," said Esquith, who is rated "highly effective" by the Times and has won numerous national teaching awards. "Teachers have to finagle the schedule." Esquith and Yi also bemoaned the increasing focus on testing and sympathized with frustrated colleagues. At Los Angeles Elementary School in the Pico-Union neighborhood, fourth-grade teacher Maria Duarte lamented the loss of time to teach science — her favorite subject and one that she said most interests her students. Over the years, the time for that subject has dropped from 2.5 days a week to 1.5 days a week in favor of language arts and math. One casualty was a popular experiment growing radishes that Duarte said taught critical thinking and research skills. Duarte was also rated highly effective in the Times analysis. Under value-added, a student's past test performance is compared with his or her current progress to measure whether teachers added — or subtracted — value to their students' academic growth. "Painfully, I decided I had to let that go," Duarte said of the experiment. "There's just not enough time — or we need to think of better ways to use our time." In Monterey Park, eighth-grade teacher Janice Pirolo said she no longer has time to delve deeply into the curriculum or stray much from it. When she does, she falls behind. When her school, Monterey Highlands, received funding to visit the Japanese American National Museum, Pirolo prepared her students by teaching them about the World War II internment of Japanese Americans. She also spent time on Martin Luther King Jr. before the national holiday named for the civil rights leader . But none of that is part of eighth-grade social studies standards, and Pirolo fell behind. For a month before the testing in May, she abandoned the textbook entirely to focus exclusively on test prep. As a result, she got through only the textbook's fourth chapter by year's end. "We have stopped reading the textbook, sadly … but you live and die by the test," said Pirolo, a 34-year veteran who teaches social studies and language arts. The nation's enhanced focus on testing began under the 2001 No Child Left Behind federal education law, which attempted to hold school districts accountable for student progress through mandatory annual tests. The law, which is under review in Congress, requires that by 2014 all students meet 100% proficiency levels in math and English — a target no one expects schools to meet. Many educators see an upside to the national focus on student achievement, as measured by test scores, and have unapologetically instilled intensive preparatory programs. Alvarado Intermediate School in Rowland Heights conducts a concentrated test-prep program before the state exams, using assessment data to identify students who need to strengthen specific skills. The sessions are held after school to preserve electives, such as computers, art and music. Attendance is mandatory, with detention for those who miss and prizes for those who participate. Principal Ying Tsao said she supported the move toward state standards and regular assessments. In earlier times, she said, teachers might skew toward language arts, say, while ignoring math. Bruce Clark, Los Angeles Elementary principal, said testing has robbed educators of some flexibility, but he said the benefits of higher student achievement are worth it. Not that there's no time for fun. Clark sheepishly said he "sold out" and held pep rallies to excite his students about the tests. Duarte motivates her students with a party and movie, bringing in treats to entice them to do well. Monterey Highlands has "March Math Madness" every year to pump up students with math-related scavenger hunts and "problem of the week" contests. To kick off the testing this year, Principal Joe Cash donned an apron and chef's hat to serve pancakes at a school breakfast — while asking math questions(How many pancakes does Johnny eat if he gets two pancakes each of the three times he comes up?). Los Angeles Elementary aims to avoid last-minute cramming by requiring 15-minute skills sessions at the start of the day throughout the year, featuring questions similar to those on the state test. Duarte prepares her students at the beginning of the year with intense work on Greek and Roman roots of words and multiple-meaning words — areas of student weakness identified by testing data. A different model is the UCLA Community School, a pilot school launched last year by the university and L.A. Unified in Koreatown. Teachers there are free to develop their own assessments. Kate Beaudet uses an individualized reading test that she said is more sophisticated, allowing her to pinpoint a child's actual reading level and areas of weakness. Beaudet and two colleagues, who joined the staff from other L.A. Unified schools, said district testing requirements had taken weeks of instructional time, skewed teaching toward what was tested and led many teachers to rely heavily on worksheets. "Teachers only want to teach reading, writing and math, because that's what's assessed," said Beaudet, who teaches a second-and-third-grade class. To prepare for state exams, Beaudet incorporated practice questions into work she did all year with literary genres, a third-grade reading standard. Using a test reading passage from an African folk tale, she read the book with her students and helped them analyze the elements and write their own test questions — which both conveyed needed skills and boosted their confidence, she said. At Hobart, Yi figures she has spent up to $1,000 a year designing more creative lessons than those offered by L.A. Unified. The district's fourth-grade reader presents only one chapter of "Mrs. Frisby and the Rats of NIMH," C so Yi bought copies of the whole book to enable her students to read the entire story. She also bought materials so students could make stuffed rats. Meanwhile, the project helped Yi's students practice a state standard: to read a set of directions and answer questions about them. She also wrote related vocabulary and comprehension questions. And Yi said that being able to read entire books has instilled in many a love of literature. Not all teachers are willing to go to such lengths. Some of her colleagues have simply used test prep books all year, Yi said. But that's not for her. "I enjoy challenging myself to think of better, different and fun ways to teach," she said. "I love to see the light of learning go on." Check out the full report, "Winning the Future: Improving Education for the Latino Community"
Today at a community conversation at Miami-Dade College, the White House Initiative on Educational Excellence for Hispanics and the U.S. Department of Education released the report Winning the Future: Improving Education for the Latino Community. The President will be delivering a commencement address at Miami-Dade College Friday evening. To view the report, click HERE. The report shows that Hispanic success in education and in the labor market is of immediate and long‐term importance to America’s economy. It also shows that Hispanics have the lowest education attainment level overall of any group in the U.S. Hispanics are by far the largest minority group in today’s American public education system, numbering more than 12.4 million in the country’s elementary, middle and high schools. Nearly 22 percent, or slightly more than 1 in 5, of all pre‐K-12 students enrolled in America’s public schools is Hispanic, but they face persistent obstacles to educational attainment. Less than half are enrolled in any early learning program. Only about half earn their high school diploma on time; those who do complete high school are only half as likely as their peers to be prepared for college and only 4 percent have completed graduate or professional degree programs. As part of the community conversation in Miami today, Senior Obama Administration officials met with dozens of educators and community leaders, to exchange ideas and outline strategies to meet President Obama’s goal for the nation to have the best-educated workforce in the world by 2020. The Coalition for Excellence in Higher Education – a group that supports higher education reform ideas offered by the state’s university presidents and chancellors and has expressed concerns with some higher education reform ideas offered from outside academia – fired a rhetorical howitzer at Gov. Rick Perry yesterday. Political observers in Texas are left wondering why the organization chose to attack Perry by name and how this will play out. The coalition’s main communications consultants used to work for U.S. Sen. Kay Bailey Hutchison and former president George W. Bush, two elected officials whose political interests have not always aligned perfectly with those of Perry. A member of the coalition’s operating committee, former ambassador and Higher Education Coordinating Board Chair Pamela Willeford, said she has supported Perry, and the organization is bipartisan and is about higher education, not partisan politics. She also said that decisions about what statements to issue are made by the organization’s operating committee, not its consultants. Wednesday, the University of Texas at Austin College of Liberal Arts Dean Randy Diehl issued a report blasting “7 Breakthrough Solutions for Higher Education” proposed by Texas philanthropist Jeff Sandefer and supported by the Texas Public Policy Foundation. The coalition issued a statement supporting the report and calling on elected officials to distance themselves from the 7 Solutions. Perry’s communications director Mark Miner issued a statement expressing disappointment that University of Texas administrators are so resistant to the governor’s cost control and reform ideas. "University faculty and their allies should join the reform efforts and recommend ways to innovate, improve graduation rates, and enhance accountability and efficiency at Texas colleges and universities,” Miner said. “We all have an obligation to meet the needs of Texas students, employers, taxpayers and our fast-growing economy. Resisting reform and accountability is an unsustainable recipe for mediocrity and stagnation. Texas deserves better." Some Austin observers thought that finished that story. But then on Thursday, the Coalition sent out a response to Miner’s statement that has grass-roots conservatives scratching their heads. The statement both attacks Perry by name and also attacks the Texas K-12 education system. This marks one of the first examples of this higher education debate, which previously centered on TPPF and comments made by University of Texas Regent Gene Powell, venturing into K-12 education. The attack on Perry and his K-12 education record comes right as conservatives nationwide are encouraging the governor to throw his hat into the presidential ring. Willeford said the coalition worked hard to recruit a bipartisan base of support and that the group is focused on higher education. "Volunteers have come forward because they believe the discussion and the process is not what we want it to be," Willeford said. "I think that trying to throw it into a political statement; it's just not true." Most of the coalition’s press releases are distributed by Jenifer Sarver, who used to work on Hutchison’s staff. Sarver is chief of staff to Karen Hughes, who used to work for Gov. and later President George W. Bush. Both currently work at the Austin office of Burson-Marsteller. “This is a statement by the coalition. This is not a statement by Karen Hughes,” said Willeford when asked about whether a coalition whose communications consultant is Karen Hughes is in a position to highlight the shortcomings of the state’s public schools. “We talked about K-12, because a lot of the problems that we have in higher education as far as graduation rates [are because] we’re getting kids [who] are not prepared coming into the system, and it’s taking a lot of remedial education,” added that she hoped the governor will focus on improving college preparation. Community colleges have many students in developmental education. But UT accepts only the best from Texas high school students. According to the School of Undergraduate Studies annual report, a mere 83 UT students required assistance in 2010 for failure to meet state college readiness standards. “We’re talking about all of higher education in the state,” Willeford said, noting that Miner’s statement referenced the statewide four-year graduation rate, not the University of Texas at Austin graduation rate, which is substantially higher. Here’s one thing we do know: the Coalition, and its supporters some of whom are prominent members of the Texas business community, has upped the ante by singling out Perry by name and responding to his chief spokesman in that manner.